“Asan Imza” has been presented at the European Identity & Cloud Conference 2018 in Munich, Germany. The Conference presented the best European practices, new trends and technologies and security standards. The event brought together more than 800 identity think tank leaders, vendors, analysts, and executives from all around the world. The conference included over 160 sessions. This year the agenda focused on identity and access management, blockchain identity, privacy and security, risk management and mitigation, world standards in provision of personal data protection and qualified trust services, and cybersecurity. More than 200 speakers, including Jasen Meece, Cloud Identity Service of IBM Security; Naohiro Fujie, Deputy General Manager of Itochu Techno-Solutions; Joy Chik, Vice President for the Identity Division in Microsoft’s Cloud + Enterprise group, Dr. Sridhar Muppidi, an IBM Fellow and Chief Technology Officer in IBM Security Systems and many others participated in the conference. Azerbaijan was represented by Jana Krimpe, the founder and CEO of B.EST Solutions, the Mobile ID operator of the “Asan İmza”. Krimpe presented two topics «Foundations for a Globally Compliant Mobile ID» and «Solving Identity Challenges in Securing Mobile Apps». David Pollington, the Head of Service Access of GSMA, Jordi Gascon, Sr Director of CA Technologies, Mike Small, Information Security Management Advisor of KuppingerCole also participated in ‘The Mobile Identity and Security’ session. 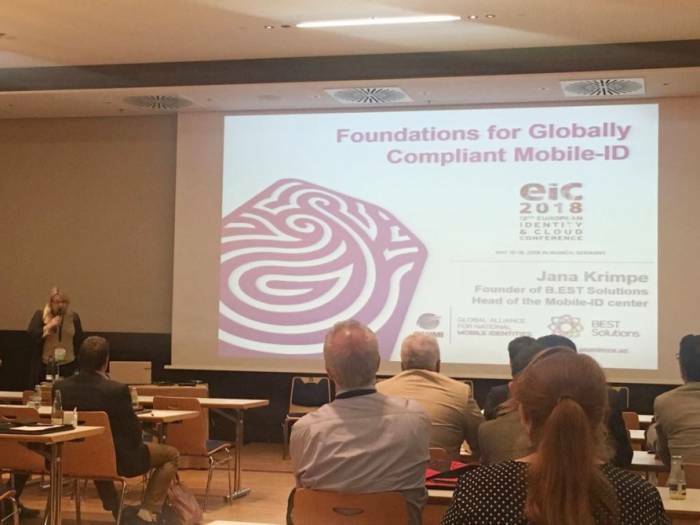 Jana Krimpe presented the Global Alliance for National Mobile Identities (GANMI), founded in 2017 to coordinate the countries providing the mobile-ID services in compliance with their national schemes. It should be reminded that the Alliance is co-chaired by Azerbaijan which is presented by Asan İmza, the National Mobile ID, and the Digital Trade Hub – the latest Azerbaijan’s e-government achievement. Both innovations were of heightened interest among the participants. The Conference also was a platform for meeting of “Women in Identity” community, aimed to foster new relationships and mentorship between women in the technical field and beyond. Among the community members are professionals as Pamela Dingle, the Director of Identity Standards at Microsoft, Dr. Angelika Steinacker, CTO Identity & Access Management, IBM Security Europe at IBM, Barbara Mandl, Advisor of KuppingerCole, Jacoba Sieders -Global Head Identity & Access Management ABN AMRO, Katryna Dow - CEO & Founder at Meeco, Elizabeth M. Renieris - Global Policy Counsel at Evernym, Emma Lindley – Senior Director at VISA, Joni Brennan - President at Digital ID & Authentication Council of Canada – DIACC, Katherine Noall - CEO at Sphere Identity and many other global experts. "To represent Azerbaijan at such authoritative world sites is a great honor for me. I am proud that Azerbaijan has already become a recognized authority in Mobile Identity and other innovative solutions of e-government. Our experience is interesting for more and more countries and international organizations as the best world practices. It is also a good opportunity for me to represent and fulfill the tasks set for Azerbaijan Innovation Export Consortium (AZNNEX) for the export of Azerbaijani technologies. The Munich conference is also an excellent opportunity to join the authoritative community of "Women in Identity", and get support and professional platform for sharing the experience of leading women experts in Digital Identity from around the world.," Krimpe said. Due to the mobility solution and easiness to use, “Asan İmza” is gaining popularity among citizens and business, and is the key component of m-government. At the moment more than 500 Public and private electronic services use “Asan İmza” in their systems. «Asan İmza» has been integrated with the call-centers of various governmental and private organizations, it is used for submitting the electronic customs declarations, declaration of goods and vehicles in customs service, registration of labour agreement notifications, on-line application to the educational institutions etc.